These up-market self-catering rustic bush lodges comprise four separate en-suite bedrooms with secluded verandahs overlooking the Hluhluwe River as well as a central viewing lounge and kitchen complex. Guests are limited to one walk per day. 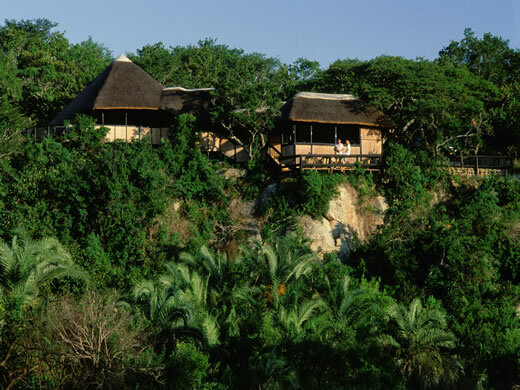 Hluhluwe is characterized by hilly topography and is thus a particularly scenic reserve. The area is noted for its wide variety of both bird and animal life. Apart from guided game drives, there are self-guided auto trails traversing in excess of 200 km of roads throughout the park. Early morning and late afternoon walks are particularly rewarding. Several hides are available throughout the park. And a number of picnic sites with barbeque facilities, some with ablutions are also available.